The "fixings" for our treat! It was my birthday (well, the day after) and I had forgone a cake this year. We had gone for a lovely little adventure down island (Vanouver Island, that is) and stayed at a lovely B&B (I'll blog about that next time, after I get the photos together). 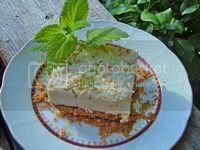 After returning home, my stepson Sean arrived and I decided to make a treat for the three of us, using the Ricemellow Creme that I had purchased during our trip to Portland recently. 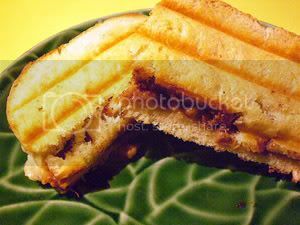 So this is what I made: Banana S'More Panini. I fired up the indoor grill first. 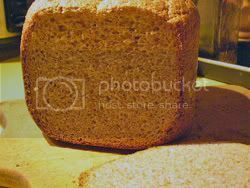 I covered one slice of my husband's good white bread (use a variety of white bread with a compact crumb, like Pain de Mie or Pullman loaf [see more about this below]; but you could use a French or Italian bread-- just don't use the "Wonderbread" kind!) with a good smear of Ricemellow Creme (3 Tbs. maybe?). Then I covered that with about 1 oz. of good organic, vegan semisweet chocolate (I used some that I got from Denman Island Chocolate in bulk), which I had shaved into little pieces with a knife. 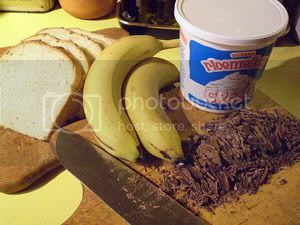 Then I covered the other slice with sliced ripe, but not squishy, organic banana (about half a largish one). It was divine! Not as sweet as I'd expected, but rich-- half of one might be enough, actually! Here's the Wikipedia definition: "Pain de mie is a type of sliced, packaged white bread. "Pain" in French means "bread" or "loaf of bread" and "mie" means "crumb." 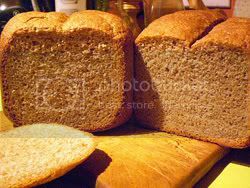 In English pain de mie is most identical to pullman loaf or regular sandwich bread. This bread has sugar in it, which makes it sweeter than most French breads, and even with the sugar pain de mie is still not as sweet as most American breads. This bread usually used for making sandwiches or for toasting. 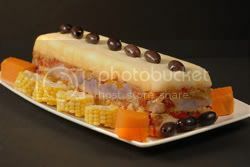 It can be baked in a sealed pan, which prevents crust from forming. If not baked in a sealed pan, the crust can be cut off (as done in factories before packaging). Pain de mie is sold in rounded or rectangular shapes." 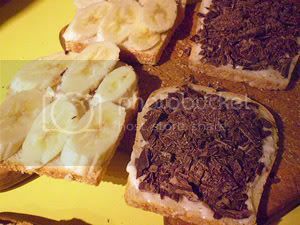 It was served extensively on Pullman railroad cars, hence the name Pullman Bread or Pullman Loaf. 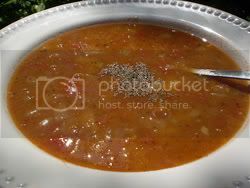 There is a link to one recipe in the text above, and here is one more. You can substitute soymilk for the dairy milk and Earth Balance for the butter in these recipes. Use half as much soymilk powder as milk powder called for. I haven't been blogging much lately-- I'm still playing catch up on emails, deadlines, and housework! Today I also have a migraine-- not a really bad one, but it hasn't gone away. (I don't get them much anymore-- one of the perks of menopause!) So, I wasn't very ambitious today. But I made a salad that we enjoyed very much, and thought I would share with you. I wanted to make a salad similar to one we tried at New Seasons Market in Portland OR, but, wouldn't you know, I had no peas in the freezer, and peas were the main ingredient! So, I improvised, and it was yummy! 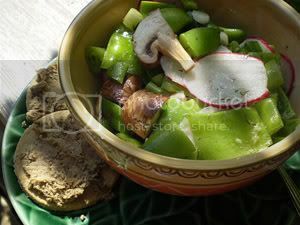 Mix together the salad ingredients in a medium salad bowl. Whisk or shake the Dressing ingredients together. Pour the Dressing over the salad and mix well. Let the salad stand at room temperature for about 1 hour before serving, or refrigerate for several hours and let it come to room temperature before serving. Nutrition (per serving): 264.5 calories; 33% calories from fat; 10.1g total fat; 0.0mg cholesterol; 340.7mg sodium; 1077.8mg potassium; 42.3g carbohydrates; 14.5g fiber; 1.6g sugar; 27.8g net carbs; 10.0g protein; 5.3 points. Use this simple mixture in place of oil in salad dressing recipes. Unlike plain juice or water, it will help the dressing stick to the greens. This recipe is easily multiplied. NOTE: Other options instead of this mixture-- cooking liquid from cooking chickpeas or white beans. Nutrition (per cup): 45.3 calories; 0% calories from fat; 0.0g total fat; 0.0mg cholesterol; 30.2mg sodium; 0.2mg potassium; 10.9g carbohydrates; 1.0g fiber; 0.0g sugar; 9.8g net carbs; 0.5g protein; 0.7 points. 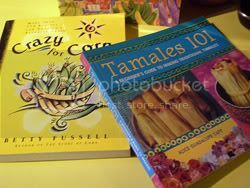 BACK HOME FROM PORTLAND VEGFEST, WITH COOKBOOKS AND GADGETS! 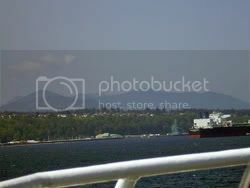 It was a lo-o-ong drive from Denman Island to Portland. 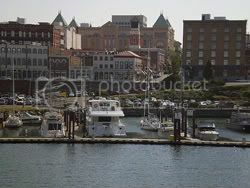 We took the ferry from Victoria, BC to Port Angeles, WA. and my Breast of Tofu. Everyone got samples a-plenty! I think we converted a few people on the spot! 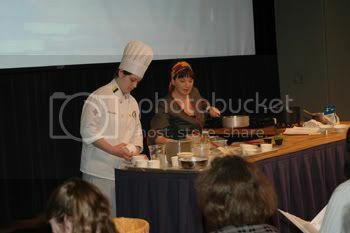 Later, we did a Q&A session, mostly on what to do with beans and grains, that was very well-attended. There was a really great atmosphere at the Vegfest-- lots of families, samples, and very inexpensive, yummy food! Everyone was so welcoming! 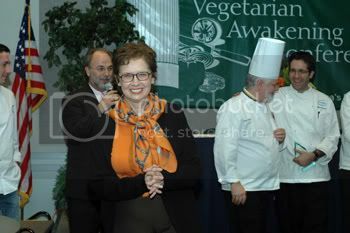 I was thrilled to meet Michelle of Herbivore, Chef Al (Albert H. Chase, Jr., Founder and Culinary Director of the Institute for Culinary AwakeningTM) and his wife Donna, and Zel (author of "The Nut Gourmet") and Reuben Allen from LA's vegparadise.com, a great resource! They were all so gracious and interesting! 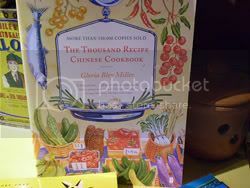 I didn't get to meet him, but Chef Brian P. McCarthy very kindly gifted me with an autographed copy of his wonderful book "The Vegan Family Cookbook". 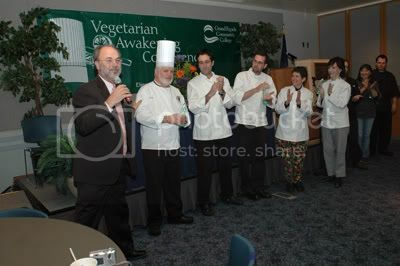 I'm so glad that vegan cooks and chefs are standing together to spread the word and help eachother! Portland is such beautiful and vegan-friendly city! 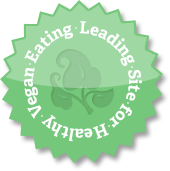 There are SO many vegan, vegetarian and veg-friendly places to eat. 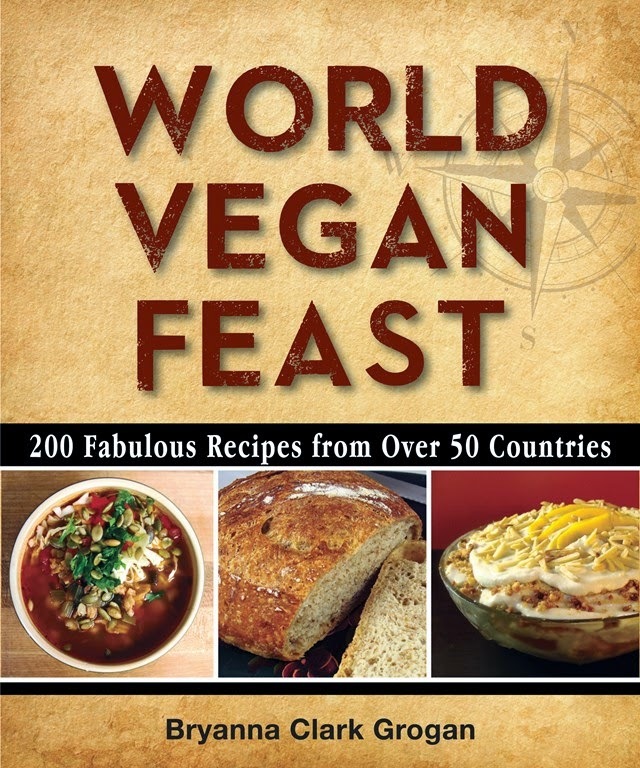 Check out this page from Northwest Vegetarian for a LONG list of restaurants. There is even a Peruvian restaurant (of interest to me because of my Peruvian father, as some of you may know already), Andina, which has a separate vegetarian/vegan menu! This restaurant has received awards for its food, too. I have to try this on my next trip to Portland! We also appreciated the free tram service in the downtown area! We had a wonderful time with our gracious and very generous hosts, the Hassons, and visited with three mutual friends, including Spice Island Vegan! I could have shopped til I dropped, if my budget had allowed! 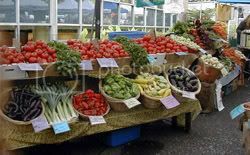 I loved visiting New Seasons Market and Trader Joe's. I was restrained in my purchases, but I came home with some Fieldroast Smoked Apple Sausages, some Ricemellow Creme Fluff (you can order it from Food Fight, Portland's vegan grocery store); some canned hominy (I add this to masa harina to make tortillas-- they are really good that way-- but hominy is expensive here); some Soyrizo; hemp milk; and some California and Oregon wine, of course! 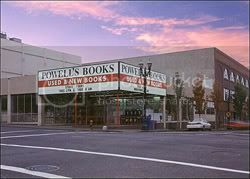 We also visited Powell's Books, the world's largest independent new and used bookseller (I like that!). 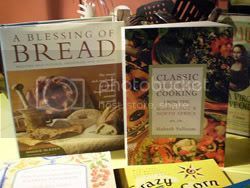 I bought 5 cookbooks for $63-- no sales tax in Oregon! 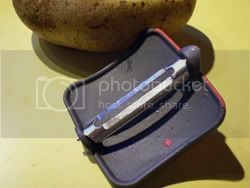 "Unlike conventional vegetable peelers that are awkward to maneuver, this clever stainless steel peeler fits right on your finger. 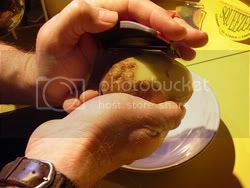 With a simple brushing motion you can peel carrots, potatoes and more using little or no hand pressure. Great for people with carpal tunnel or arthritis "
My husband and I both love it already! 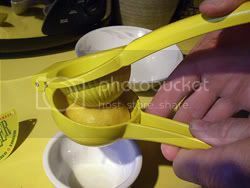 "If you love lemons for baking, cooking or for fresh lemonade, you’ll need to keep this Lemon Squeezer at hand. Literally. It’s so convenient and fast. 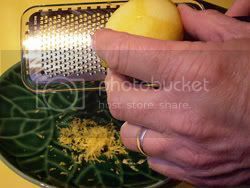 Insert half a lemon at a time and press down. 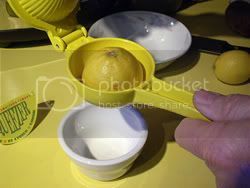 It turns it inside out and you get all the juice in seconds without the seeds and pulp. And it comes in an attractive yellow so it’s easy to spot in your drawer. Coated metal construction means it won’t rust or react with juices." 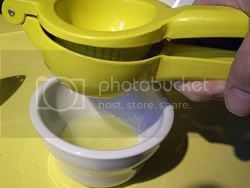 You get alot of juice when you use this squeezer! 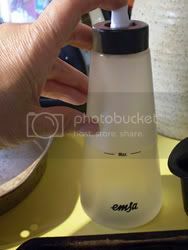 This is the EMSA glass oil sprayer . Julie has had hers for 8 years, and it gets way better reviews than the metal ones. I have been using plastic versions, but they are not recyclable, so I don't want to use them anymore. The EMSA works really well! 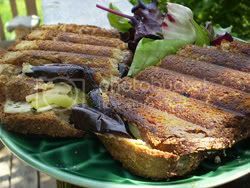 Grilled panini made with my sourdough-enhanced 100% wholewheat bread machine bread filled with grilled eggplant, grilled zucchini, basil, homemade Tofu Mayonnaise, and Smoked Cheddar Sheese. I sprayed the bread with oil from my new oil sprayer before placing in the grill. Yum! The two recipes below; sourdough loaf on the left, yeast sponge loaf on the right. 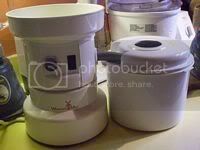 When I did my post on grinding my own wholewheat flour with the Wondermill and making a light loaf of 100% wholewheat bread with it, a reader asked me if that recipe would work in a bread machine. Well, I finally tried it and it was a disaster-- well, it actually tasted pretty good and I used it for toast, but it fell in the middle and it was kind of coarse and very dark in color. Obviously, that recipe is best made the old-fashioned way! I decided to stick with a tried-and-true wholewheat loaf with more potato in it than in my oven recipe. Potato is a great lightener-upper of wholegrain breads! 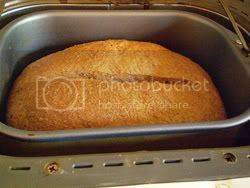 I also used the sponge method-- which is basically leaving the liquid, yeast and half the flour (a batter) to rise for several hours before adding the remaining ingredients and turning on the machine cycle. One recipe uses a yeast sponge and the other a sourdough sponge. Otherwise they are pretty much the same. Why bother with this extra step? 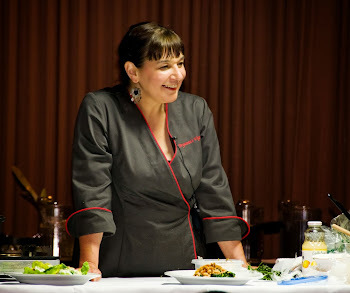 It's all about umami, the "fifth flavor", the "essence of deliciousness". It turns out that bland old wheat gluten contains umami compounds. 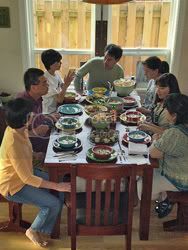 Mushrooms and fungi are a great source of synergizing umami. 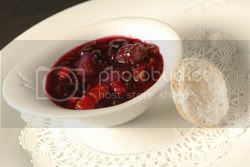 Yeasts (both active, and non-active nutritional yeast and yeast extract, such as Marmite), which is also a fungi (and this includes sourdough, a natural yeast) , have umami compounds. They also act as synergizers. 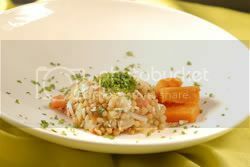 For instance, in a live yeast or sourdough starter, the enzymic action develops the umami in wheat flour to "ripen" the dough and develop its flavor. Now this brings me to a favorite hobbyhorse-- I've been writing for years that fast-risen breads seem tasteless, and most bread machine breads have a "homogenized" flavor no matter what you put into them. 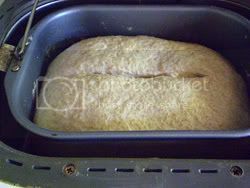 I knew that this was due to the lack of rising time, which develops enzymes and "ripens" the dough and improves the crust. 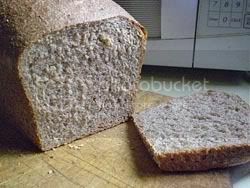 I've been telling people for a long time to try making their bread machine breads with an overnight sponge, or the addition of sourdough starter. But I had no idea that it was umami at work! So, I give you here two versions of a bread that I have been making for years and which I re-vamped for the bread machine. They both come out nicely-shaped, light and tender, AND with excellent crumb, crust and flavor! NOTE ABOUT FLOUR: Canadian flour is higher in gluten (protein) than US flour, so Canadians can use ordinary wholewheat flour. 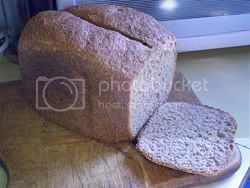 Americans might want to use wholewheat bread flour. This is an adaptation of a recipe I have made in the oven for years. 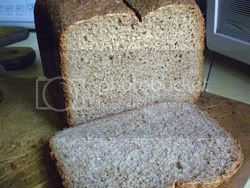 This recipe makes a tender, light wholewheat bread. You can use this as a base for all sorts of variations. NUTRITIONAL ANALYSIS done using water, 2 T. sugar, no soymilk or soy protein. I make the sponge just before I go to bed at night, and add the other ingredients first thing in the morning and start the machine. Time-saver: use 3/4 c. instant mashed potato flakes mixed with 1/2 c. boiling water instead of cooked potato. Mix in the bread machine container (this is the one I have) the water 1 cup flour, and 1/2 tsp. yeast on the dough cycle for 5-10 minutes, then unplug. Cover the container with plastic wrap and let it rise. After the sponge has risen (4-8 hours), add the mashed potato, sugar, oil, salt, flour and the remaining yeast, in that order. Set on the Basic Cycle. Check the dough during the first knead to make sure that it is neither too dry, not too wet. If it's too dry, add water by the tablespoonful, letting it knead in, until it looks right. 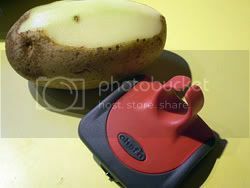 (I often have to add 1 T. or so-it kind of depends on how dry the potatoes are.) If it's too wet, do the same with flour. This is a wet dough but still rises well. It's fine as long as it kneads well, even if it looks a little sticky. If you want a more attractive top crust to the bread, 5 minutes before the bread is due to bake (I set my kitchen timer to remind me of this), you can make a decorative slash in the top of the bread with a razor blade, and you can also glaze the bread with some soymilk, using a pastry brush, or sprinkle the top with some flour. 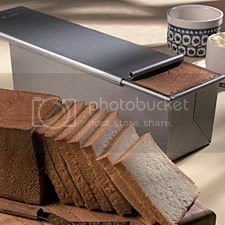 Cover the "window" in the top of your machine with foil, so that the top of the bread will brown properly. 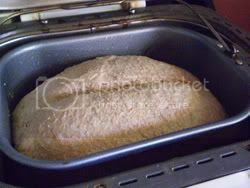 Remove the bread immediately from the machine when done, placing on a rack to cool thoroughly. This will insure a crisp crust. Nutrition (per 1/2 slice): 103.9 calories; 14% calories from fat; 1.7g total fat; 0.0mg cholesterol; 175.5mg sodium; 129.7mg potassium; 20.2g carbohydrates; 2.8g fiber; 1.0g sugar; 17.4g net carbs; 3.2g protein; 1.7 points. This is almost the same as the wholewheat sponge bread above, but with a wholewheat sourdough starter used as well as the yeast. I think it is a bit superior, but they are both good! NUTRITIONAL ANALYSIS done using water, 2 T. sugar, no soymilk or soy protein. Time-saver:use 3/4 c. instant mashed potato flakes (you can buy organic ones) mixed with 1/2 c. boiling water instead of cooked potato. Set your machine (this is the one I have) on the Basic Cycle. Check the dough during the first knead to make sure that it is neither too dry, not too wet. If it's too dry, add water by the tablespoonful, letting it knead in, until it looks right. If it's too wet, do the same with flour. This is a wet dough but still rises well. It's fine as long as it kneads well, even if it looks a little sticky. Nutrition (per 1/2 slice): 107.1 calories; 14% calories from fat; 1.7g total fat; 0.0mg cholesterol; 175.3mg sodium; 123.9mg potassium; 20.9g carbohydrates; 2.6g fiber; 1.6g sugar; 18.4g net carbs; 3.1g protein; 1.8 points. SOURDOUGH STARTER: If you already have a white sourdough starter, use 1/4 cup of it to make a wholewheat starter. You can get a very good free starter online here: Oregon Trail Sourdough Starter. I have been using this one for several years. You can also email me for my vegan yogurt-based sourdough starter instructions. Refresh the starter before using it in this bread-- it has to be fresh and bubbly! 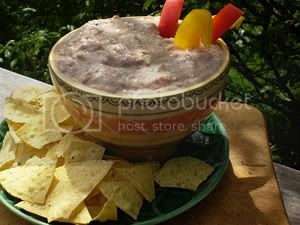 This dip is inexpensive, a bit spicy, creamy, and full of fiber! I like using blackeyed peas because they don't need to be soaked, and they cook quickly. 2 Tbs vegan "bacon bits"
Place the drained blackeyed peas, tofu, lemon juice, salt, garlic granules, and sugar in a food processor. Process until smooth. Add the onions and pulse. Add the salsa and soy bacon bits and pulse again. Scoop into a bowl. Cover and chill. Serve with baked tortilla chips, wholegrain bagel or pita chips, or raw vegetable dippers. Nutrition (per 1/4 cup): 52.9 calories; 11% calories from fat; 0.7g total fat; 0.0mg cholesterol; 285.6mg sodium; 137.8mg potassium; 8.1g carbohydrates; 2.3g fiber; 1.8g sugar; 5.8g net carbs; 3.9g protein; 0.7 points. Rinse the split peas and leave to soak in plenty of water overnight. Heat the oil in a large heavy pot and saute the onions until almost soft, adding the garlic towards the end. Add the drained tomatoes, the mint, and the optional cayenne pepper, if using. 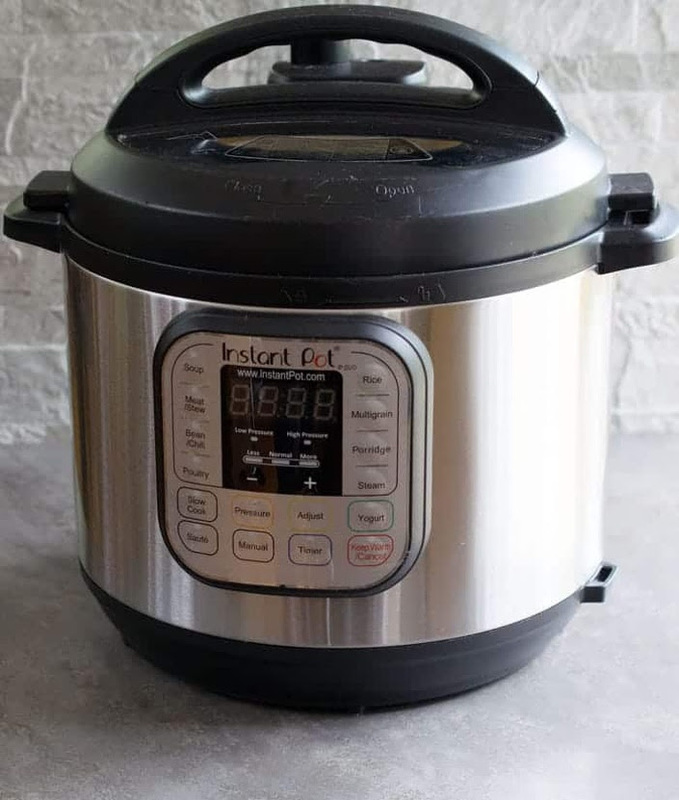 Cook down for 10-15 minutes. Add water, broth, and reserved tomato juice, bring to a boil, then add the drained, soaked split peas. Reduce the heat and simmer for 2 hours, or until the peas are tender. Add the chickpeas and the diced potatoes, bring to a boil, then reduce heat and simmer for 30 minutes. Add the oregano, salt and pepper. Taste for seasoning. Serve immediately with good bread. You can garnish each bowl with a sprinkling of chopped fresh cilantro, minto or parsley, or some dried mint. Nutrition (per serving): 277.3 calories; 11% calories from fat; 3.7g total fat; 0.0mg cholesterol; 831.7mg sodium; 1047.4mg potassium; 50.2g carbohydrates; 13.6g fiber; 9.7g sugar; 36.6g net carbs; 14.0g protein; 5.1 points. This is just photos, all by the extraordinary New York food photographer, Linda Long, who must have taken thousands of photos and just never stopped! This is just a few, because it takes me a while to edit and resize all the photos for the blog, and I'm computer-weary this week. 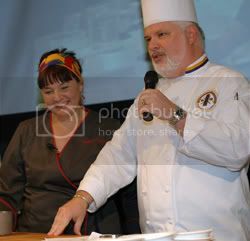 I'll be posting more pics of the chefs, the food, the audience, the students, etc., very soon! 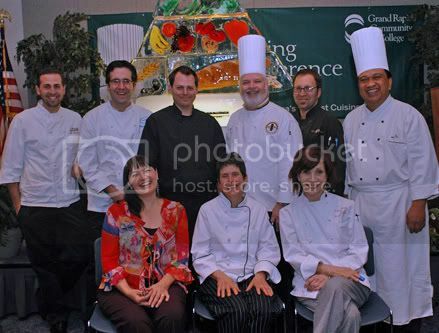 For a review of the 2007 conference and more photos, check out the April 15, 2007 post at this website. In the kitchen with Corey, one of my wonderful student chef assistants-- Corey had a real epiphany about vegetarian cuisine! Wonderful Hospitality Department Program Director Randy Sahajdack thanking Kevin for all of his work.